Put together a horse and rider, skier, tow rope, and a snow-packed obstacle course with ramps to jump and rings to grab, and what do you have? Skijoring, a winter sport that's almost as exhilarating to watch as it is to participate in. Skijoring (photos courtesy of Steve Sunday; Leadville/Lake County Visitor Center) has long been practiced in places like Scandanavia and Alaska. Instead of a horse, skiiers can also be pulled by a dog, snowmobile, or even a mule. Skijoring has become much more popular in the last few years, and along with the growth, competitions have popped up all over the country. Many events include lessons for rookies before the main competition, during which veteran teams take to their saddles and skis and blast through the course in pursuit of the fastest time – and, usually, a not-too-shabby purse – in an unforgettable, Wild West display of skill and athleticism. Skijoring competitions are often part of winter festivals that are a draw in their own right, with everything from polar plunges to snow mountain biking on the docket – all of which make for a winter weekend getaway way more interesting than, say, just hitting the slopes. Here, a few spectator-worthy destinations, with the added bonus that most events are free to watch. 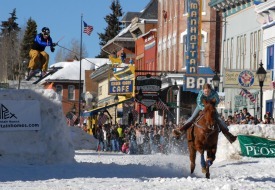 Whitefish Ski-Joring, Montana; January 29-30, 2011: Now in its 8th year, skijoring is part of the popular Whitefish Winter Carnival, in honor of Ullr, the Norse god of snow. Skijoring is a highlight on the schedule of family-friendly activities, which also include an icy plunge into Whitefish Lake and a torchlight ski parade. Most events are free; see www.whitefishskijoring.com for more info. Carnaval de Quebec, Canada; February 5-6, 2011; The skijoring competition falls in the middle of this massive, three-week winter festival that draws nearly a million visitors. Races begin at noon and end around 4pm; visit www.carnaval.qc.ca for more info. Leadville Ski Joring, Colorado; March 5-6, 2011: This charming, one-stoplight town about 90 minutes from Denver is the home base for many an outdoor enthusiast, with two 14,000-plus-foot peaks in the vicinity and the adventurous pursuits that go along with it. But when the annual skijoring competition comes to town as it has every year since 1949, attention turns toward Harrison Avenue, which is packed with tons of snow and made into one of the most challenging courses on the circuit. The competition coincides with the town's Crystal Carnival, which also features events like a paintball biathlon and sled dog races. Events are free to watch; visit www.leadvilleskijoring.us for more info.